3x2 R/S Regularised Graded Building Timber (44x71mm ex 50x75mm) under 4.8M. In general we are now sourcing this timber as a very high quality German Whitewood Easi Edge Carcassing Timber - kiln-dried, regularised with eased corners,­ and graded to C16 or C24 specifi­cation. 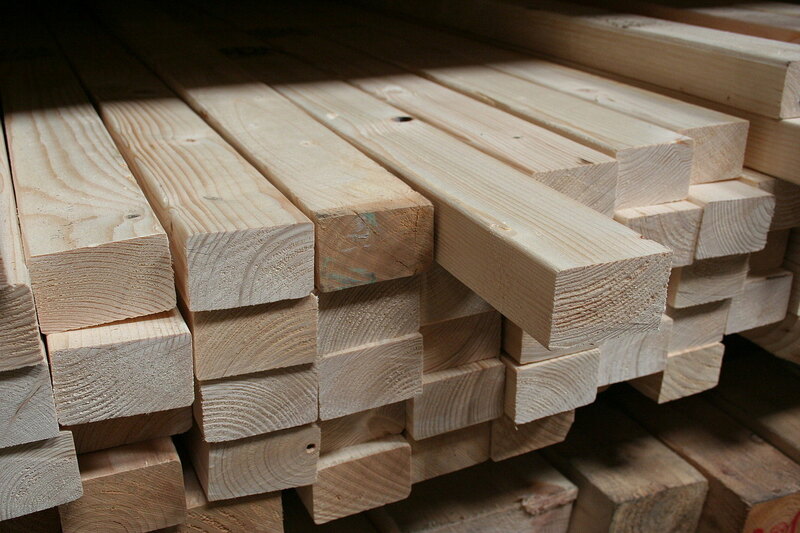 Normal lengths are 3.0, 3.6, 4.2 & 4.8 metres; We keep a good selection of larger sized timbers in stock, up to 9x2" / 47x225mm in the Easi-Edge, and 12x2" / 47x300mm in an Unsorted Whitewood Rough-Sawn Carcassing timber; Longer lengths - 5.4 & 6.0 metres are available in the Rough-Sawn timber. However, we can also source larger sizes and lengths to order. Timber is a natural product - variations in colour, knots, grain and texture should be expected - they are not a defect. Price is generally per running metre or per length - we can price larger quantities and pack lots per cubic metre. 3x2 inch Regularised Carcassing Timber is a natural product - variations in knots, colour, and grain should be expected - They are allowable. A certain amount of checking and splitting occurs, and is allowable in the Grading Specifi­cation; 75x50mm Timber can be Grade-Stamped for strength, where required. 75mm x 50mm Regularised Graded Carcassing Timber is kiln-dried; Unseasoned 75x50mm timber can have a moisture content approaching the maximum saturation level of 27%, when air-dried "in-stick" this can fall to 20-23%, and if kiln-dried the moisture level is brought down to 18-20%. Generally in a heated building, the moisture level can be 8-10%, and it is here, when the moisture level of timber is rapidly changed, that twisting, warping and splitting can occur. We keep tilt-fillet in stock and can cut firring pieces and other timber sections to size for flat-roof and pitched-roof work. 3x2 inch Building Timber needs suitable external treatment, finishing and maintenance for exterior use; External use is at your own risk. - JAS Timber cannot be held responsible for any variations in 3x2 Regularised Timber sizes, pattern, construction, grading, moisture-content, treatment, certi­fica­tion, knots, colour or grain. We cannot exchange any 3" x 2" Construction Timber once work has commenced; 75x50mm Regularised Timber Orders at variance with our Stock-holding and All Direct Deliveries are supplied as a Special Order. Don't forget our Roto Oak Roof Windows if you are undertaking a barn conversion project, or if you simply want the best roof window - a unique product from JAS Timber - Blackburn, Lancashire. Payment - We can take Debit Card, BACS, Cash, Cheque or Credit Card payment online for 3x2 Regularised Building Timber. Direct Delivery of 3x2 Regularised Building Timber may be possible from some of our suppliers, in large enough quantities. XDP parcels can be up to - 2400x400x400mm and 10Kg costing £11.40 +vat then 50p per Kg +vat; We would send Wood Joists longer than 2.4M with TNT. Haulier Delivery by pallet can be arranged for larger quantities of 75mm x 50mm Eased-Edge Wood. E. & O.E. see T&C- We do try to keep prices and specifi­cations of 75x50mm Timber correct, but mistakes can be made! Please let us us know if you do spot any errors - thanks.